Turning 60 is a huge milestone for anyone. There are many things to be grateful for after living your life for six decades. At the same time, there is a whole new category of aches and pains that are part of the package as you hit your golden years. It’s always a celebration when someone crosses this magic number, but treat the occasion with much humor. Make the celebrant smile with a lighthearted yet sincere message that shows you truly care for the person. As an alternative, you can serve up an inspirational message taken from the list below, but make sure to personalize it to be more suitable for the recipient. 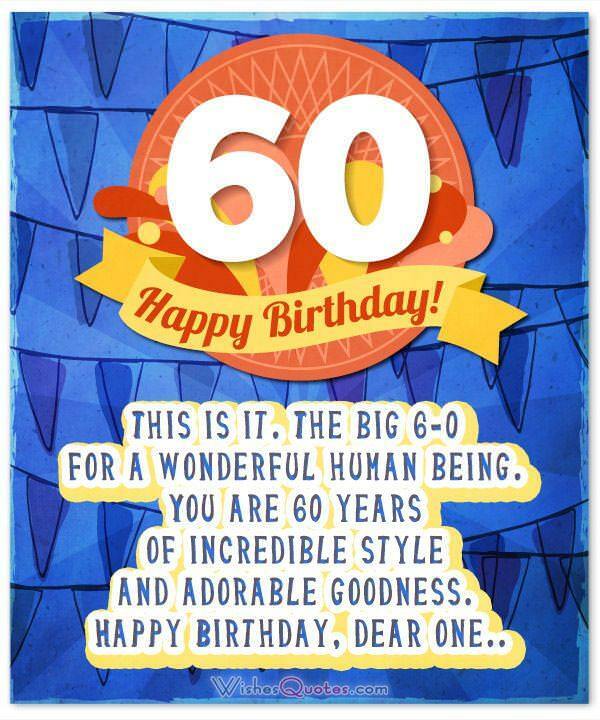 Whether the birthday celebrants feel joyful about turning 60 or anxious about life after 60, send them birthday messages that focus on how special the occasion is to you and to them. Choose one among these messages, and make sure to give it a personal touch to bring good cheer to someone turning 60. Glorious, glorious 60. Happy Birthday to you. The senior discounts will come pouring in. This is it. The big 6-0 for a wonderful human being. You are 60 years of incredible style and adorable goodness. Happy Birthday, dear one. Live your life as you see fit because the only rules that apply to 60-year-old people are those that you’re making up as you go along. Enjoy your wonderful birthday. 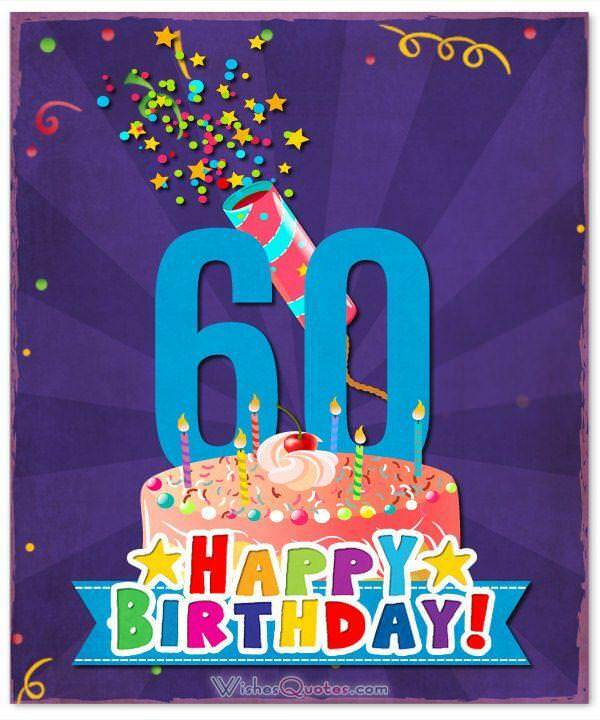 Here’s a bumper sticker in honor of your 60th birthday: I’m 60. I get to drive at my own speed in the fast lane, and I’m not in a big hurry to get anywhere. You are 60 years of amazing blessings to all the people whose lives you touched. Wishing you a wonderful 60th birthday. 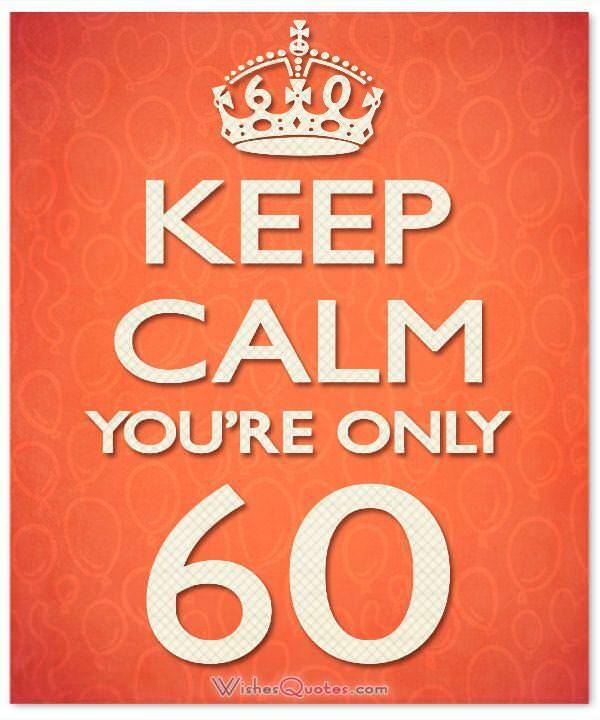 By turning 60, you get to walk away from the troubles of being a 50-something. That’s worth celebrating right there. Cheers on your 60th birthday. Now that you’re 60 years old, it’s time to be brave and bold. Don’t let anyone tell you that hang gliding, skydiving and skinny dipping are not for you. If you want to do it, go for it. Don’t listen to those who will tell you that at 60, time is not on your side. You have 40 more years before you reach the century mark. Relish every minute of every day starting with today’s celebration of your 60th. You’re 60 and proud of it. You’re 60 and grateful to be alive. You’re 60 and zipping along like the kids in their 40s. These are great reasons to celebrate. Happy Birthday. You know you’ve turned 60 when you yell at the TV regularly, but you watch the Weather Channel most of the time. Happy Birthday to a superb specimen of a 60-year-old. Life Tip #128: You don’t need a tracking device for your glasses. They are usually on top of your head. Cheers for an exciting 60th birthday. You’re 60 today – own it. You won’t get those amazing senior discounts otherwise. Sixty is the new 50. Live it up, and dance to your heart’s delight. Happy Birthday to a Life Expert. We are grateful to have known you for at least part of the 60 years of your magical life. You have been an inspiration to us all. Have a joyful birthday today. Here’s to a beautiful human who has made the world a better place just by being in it. Have a great 60th birthday. You are a shining example of a person who faces challenges head-on, making lemonade out of every lemon and finding the silver lining in every cloud. Happy 60th Birthday. Cheers to you on your 60th birthday. May it be as fabulous, wondrous and adventurous as you can tolerate. Age is just a number, and it’s not even the number that should matter most except for the time when you hit 60. Have a wonderful birthday. Life Tip #107: At 60, wrinkles are just laugh lines, which serve as proof that you have lived life to the fullest. Happy Birthday, wise one. Throughout your 60 years, you have proven that you march to the beat of your own drummer. You are your own person and a most admirable one. Have a 60th birthday as fabulous as you are.